An amazing story. Even though the video is in dutch there are subtitles and worth a watch. Conrad Schumacher is an amazing classical dressage instructor. His interview and panel discussion is enlightening. 92 year old man saves child from runaway horse. This is a good chart to compare instructor qualifications from different countries. chart Thanks for Stefania Montini for passing this to us. HoofbeatZ for the third year running is offering its Horse Summer Camp for kids. Book early for disappointment. Horsemanship is every where. This is a video from India. All I needed to Learn I learned from horses. HoofbeatZ are pleased to have hosted 90 school children this morning for a day with horses from Kings Dubai School. It was indeed a fun filled morning with edutainment and learning through horses. 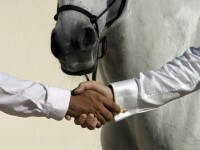 HoofbeatZ wishes to thank Kings Dubai School, the children, all the volunteers, staff of HoofbeatZ and ofcourse the horses. On April 7th, 2014, the Spring Camp at HoofbeatZ started with a very good attendance. The kids had a great day from 10 AM to 1 PM, riding, grooming, arts and crafts, ez ride, trick riding, horse sense sessions and learning all about horses. The camp continues and there is always room for more. Eurodressage Editorial: The Dark Side. HoofbeatZ horses were featured in a desert filming for the video shown at the ceremony on the big screen. We are proud to be associated now since 2011 with every World Cup held in one way or the other. Karen Stewart riding the stunning Euwe. Three of HoofbeatZ horses have been selected for a film shoot in the desert for special short film for the Dubai World Cup. The horses and staff are all ready and this weekend we expect the shoot to go all well. A very young rider in a dressage competition. This is super cute. A very creative Ad with a Horse. On Jan 23rd Hoofbeatz Performed at the Meydan racecourse in connection with the Chinese New Year. The team did and excellent job the video can be seen here Post by Hoofbeatz Entertainment & Events. HoofbeatZ team is going across to AL Shaqab in Doha Qatar to assist in the events related to the Qatar National Sports day on February 11, 2014. The event around horses is open to public and horse related activities are planned for the whole day. HoofbeatZ is very proud of being associated with the event. A Comment on HoofbeatZ Camp in Qatar. All the HoofbeatZ horses have moved into their new stable at the new site. Very airy, with a 8 meter alleyway and stalls designed so horses can see each other, its a welcome relief from the walled in stalls many places have…The atmosphere is just lovely..
HoofbeatZ Entertainment team performs tonight at the Meydan Racecourse for a special event during the Dubai World Cup carnival meet. Its part of a fantastic performance that Prisme International are putting together. We are very excited about it all. Anne Boulet and Fabian, looking elegant as ever. Joey Armaly rode a beautiful test of Csaba. One of our upcoming young riders with HoofbeatZ horse Morita. Competing prelim. Jim Wofford’s ideas of using poles for dressage horses. Hoofbeatz had a good showing with all their horses at the Desert Palm dressage competition on Jan 10, 2014 Madison Flooks 1st in Intro and 1st in Prelim (Morita) Jasmin Hanson 1st Club `section Novice (Pajarito) 2 nd Medium (Cuazro) Anne Boulet 3rd Prelim and 3rd in Medium/Elementary (Fabian) Well done team excellent results. Her regular ride and what a wonderful ride.